1. She has spent six hours on the phone with Time Warner. 2. Time Warner is the only service provider available to her. 3. She alleges a history of poor service: "The city of Moorpark in the past has fined Time Warner for treating customers as I have been treated." 4. She encourages others to fax Los Angeles City Attorney Rocky Delgadillo if they have similar problems and ask Mr. Delgadillo to consider a second lawsuit. 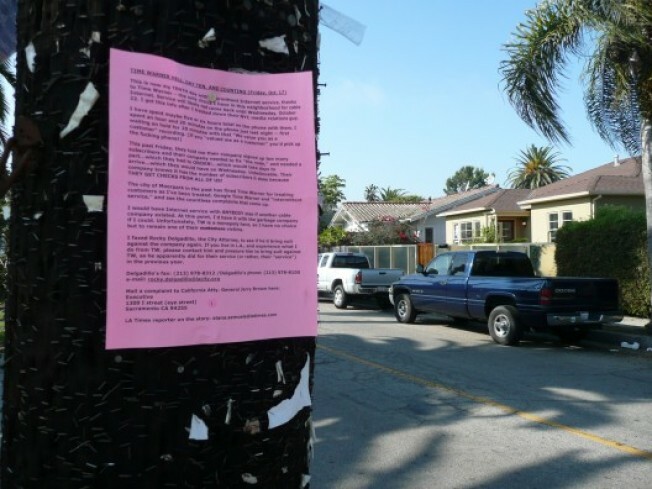 UPDATED: A commenter notes the note was put up by Amy Alkon. She's a syndicated columnist--no wonder she is pissed.